21 MacKinnon Talbot 70 Mackinnon 1 ret. 44 Stalter Lorraine Stalter 1 ret. 48 Jackson Bugatti Type 43 Jackson 1 ret. 60 J. Walters / J.A. Driskell Ford V8 J. Walters 1 ret. Alexandra Lindh won the Ladies Cup in class 1 (large cars). Class 2 winner: Peugeot 201A driven from Umea by G. de Lavalette and Charles de Cortanze. MacKinnon and his Talbot. He didn't finish. 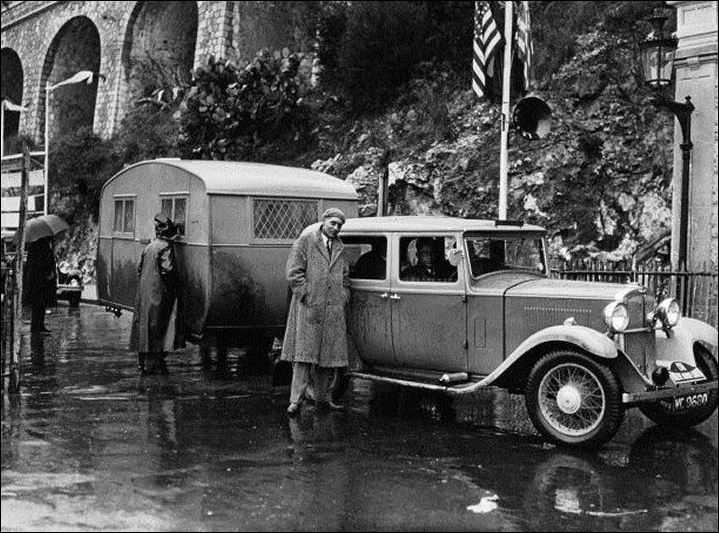 Noble's Hillman #51 with a caravan. Robertson's #224 Riley and Trondsen's #84 Studebaker. Laury and Lucy Schell's Bugatti finished 7th. Alexandru C. Berlescu from Romania finished 10th in his #89 Chrysler. 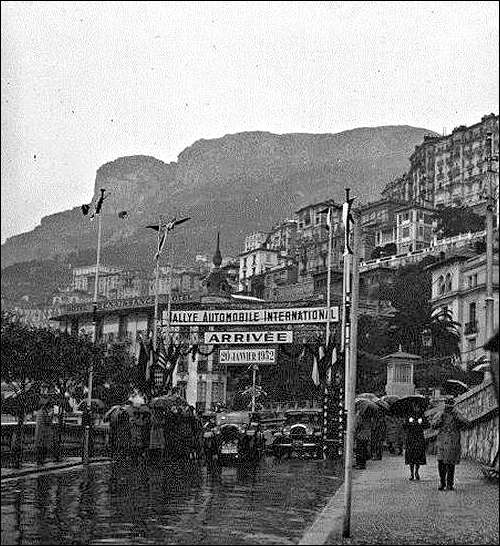 PITY a poor scribe endeavouring to give some account of an event covering the immense distances and widely separated starting points used in the Monte Carlo Rally, points as far apart as John o'Groats, Athens. Lisbon and Umea, which latter is far away on the shores of the Gulf of Bothnia, 500 miles north of Stockholm, and barely 100 miles from the Arctic Circle. 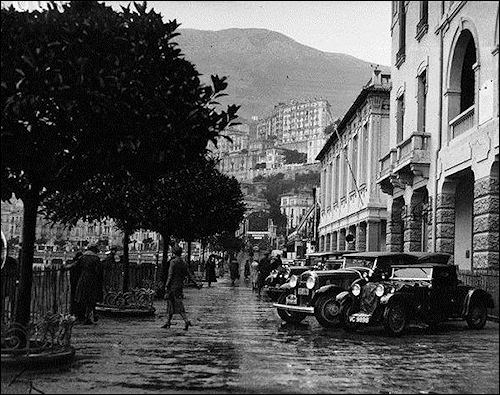 This latter starting-point had been selected by the majority of competitors, as, although Athens was 35 kilometres further away from Monte Carlo, and therefore yielded the greater number of marks for distance covered, it was regarded as almost impossible that any entrant from there would be able to get through at an average speed of 25 m.p.h. Ditched! Max Klinkle's "Merc" near Umea. Most of the British drivers were having their first experience of driving on icebound roads as they journeyed north to their selected starting-point, though the old hands who had started last year from Stavanger were able to give the novices the benefit of their experience. Certainly it seems odd to refer to such a driver as W. B. Scott as a novice, but Scott, in common with all the rest of us, found that he had to learn to drive all over again. A typical Swedish road under winter conditions may be briefly described as a steeply cambered ice-covered surface bordered on either side by innocent-looking snow banks, but we soon learnt to dread those same snow banks. Deviate one inch too far to one side, and the front wheel, touching the snow, was forced round with inconceivable rapidity and inhuman power, and in an instant the car lurched, tilted, and stopped with the near-side wheels buried in the treacherous snow-filled ditch to a depth of anything up to two feet. Also we all had to learn to drive without brakes as the slightest application of them caused an immediate and uncontrollable four-wheel skid. 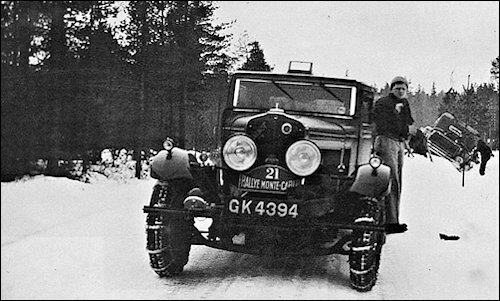 Before reaching Stockholm from Gothenburg, where a British contingent consisting of Lord de Clifford (Lagonda), H. E. Symons (Sunbeam), Harrington-Harvard (Talbot), McKinnon (Talbot), Mrs. Vaughan (Triumph) and J. Hobbs (Riley) landed, McKinnon's 70 Talbot slid off the road, and remained perilously poised with one front wheel over a drop of 30 feet. The passengers were afraid to move in case the car went over the edge, and McKinnon was heard to exclaim from "I'm no excited. I'm no excited. Stay where ye are." Eventually they were rescued by a passing lorry, and arrived at Stockholm. Their driver was heard explaining to McKinnon, that he was through with the run, adding "I'm no going on. I'm awa hame to Glasgie." So we journeyed north learning to drive again, learning that to take one's eyes from the road for one fifth of a second spelt disaster, learning what to do when the ice-covered road sloped sharply downwards to a turn over a narrow bridge which had to be negotiated without braking, with rear wheels sliding, and with front wheels answering not at all to any movement of the steering wheel. It wasn't easy to learn to get round corners with no rear wheel grip, and no apparent connection between the steering wheel and the front wheels. But we learnt it by degrees, though W. B. Scott was unmercifully ragged for ditching Symons' Sunbeam three times in one day's run. It was a strange experience to sit at the steering wheel with the perspiration pouring down one's face while the temperature was at freezing point. Eventually we arrived at Umea, a very pleasant little town, with a good hotel and good shops. Arnold, a member of Lord de Clifford's team, was in great request as an interpreter, and was promptly christened "Lorenzo the Linguist." The weather was pleasantly warm, and, although the thermometer was just above freezing point overcoats were quite unnecessary. We did not then understand that the unprecedentedly warm weather was to bring us our greatest trial. The small car class, including Leverett on a new model six-cylinder Riley of 1,496 c.c., and Mrs. Vaughan with a lady passenger on a Triumph 9, left for the South at 3 p.m. on Saturday afternoon, while 12 hours later the big car class started, headed by Louis Chiron (Bugatti), in a merry little snow-storm. 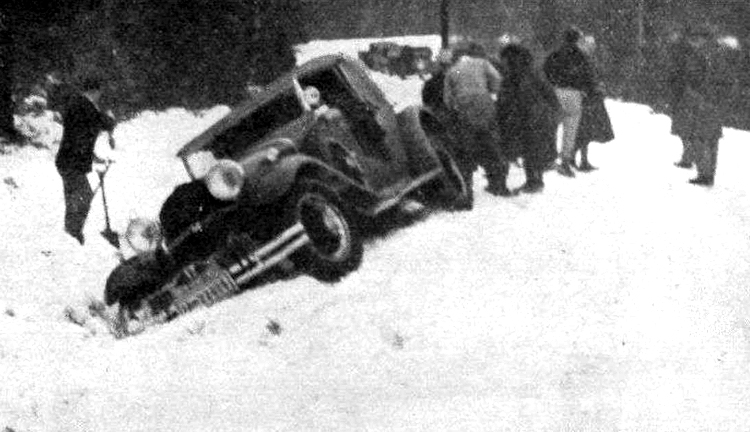 De Clifford, who was undoubtedly the best British driver on ice-covered roads, got along at a very good speed, and actually covered 36 miles in the first hour as the powdering of snow afforded a good grip for the special Dunlop military type Track-Grips tyres he used, without chains on the rear wheels of his Lagonda. Fog was the next obstacle encountered, but this did not last very long, and the first control at Sundsvall was reached in good time. About 170 miles south of Sundsvall our real troubles began. Picture to yourselves a road covered with ice, twelve to fourteen inches thick, gleaming white in the headlamp beams, and swimming in water from a heavy rainfall: a surface on which it was absolutely impossible to walk, and difficult even to stand! Over this we were supposed to average 24 m.p.h. Cars and lorries were ditched all along the roads, and the mental agony of meeting another car and knowing that one had to go within a few inches of the edge of disaster to get by was a terrific strain. Even our star ice-driver, de Clifford, was unable to average more than about 20 m.p.h. and we saw our hardearned gain of time rapidly disappearing. H.E. Symons (centre) of "The Motor" with Lord de Clifford and Harrington-Howard standing alongside the Sunbeam. So we proceeded, mostly sideways, towards Stockholm, which we eventually reached at 10 p.m. on Saturday, having covered 480 miles in 181 hours, with which result we felt very satisfied. Symons (Sunbeam) arrived at 11 p.m. and Healey (Invicta) who had left Umea 11 hours after us, arrived at 1.15 a.m. on Sunday. Discouraging reports of the road conditions were given to us at Stockholm, and they were fully borne out. After 20 miles of good, going on snow-covered roads we struck again this infernal wet ice, and our gyrations recommenced. The number of times that we changed wheels, trying different combinations of tyres with chains and tyres without chains, passes belief, but we managed to keep going. At last we reached, Jonkoping, which was known to the British competitors as one of the brothers Koping, and south of this town the ice disappeared. True, the roads were snow-covered and at home in England one would probably hesitate to use a car at all under such conditions, but we were now salted subarctic motorists and we hailed, these roads with merry acclamations. Speeds rose as spirits did likewise, and it was a joy to see one's speedometer again reading 80 and 90 and 100 kilometres an hour. On towards Helsingborg and the ferry across to Denmark, daylight again, dry roads, and life became worth living. Twenty-five minutes in the ferry and we landed in Denmark, and headed at high speed for Copenhagen, the next control. Fighting our way into the control office through a seething mob we signed on, and left for Faaborg and the long ferry journey of 1 hour 20 minutes to Nyborg. 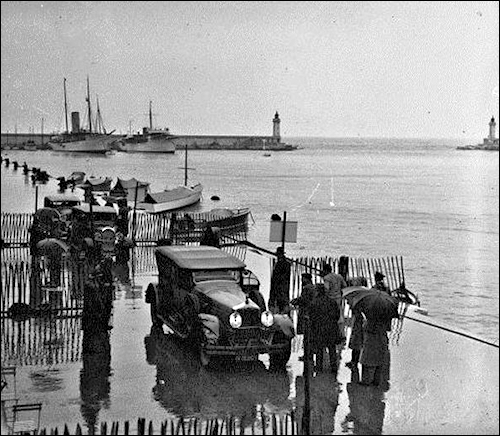 On this ferry with us were Symons' Sunbeam, Widengren's Alvis, a Chenard Walcker, a Ford and a Rosengart. Arrived at Nyborg, we proceeded to another control at Odense, signed on and left in a hurry for Middlefart and the ferry to the mainland of Denmark. It was a matter of some urgency to waste no time as we knew that the ferry could carry only five cars at a time, and it would be a case of first come, first served. We stood, therefore, not upon the order of our going but roared on through the night across the flat Danish roads. We passed three competitors over this stretch and gained our place on the waiting ferry. 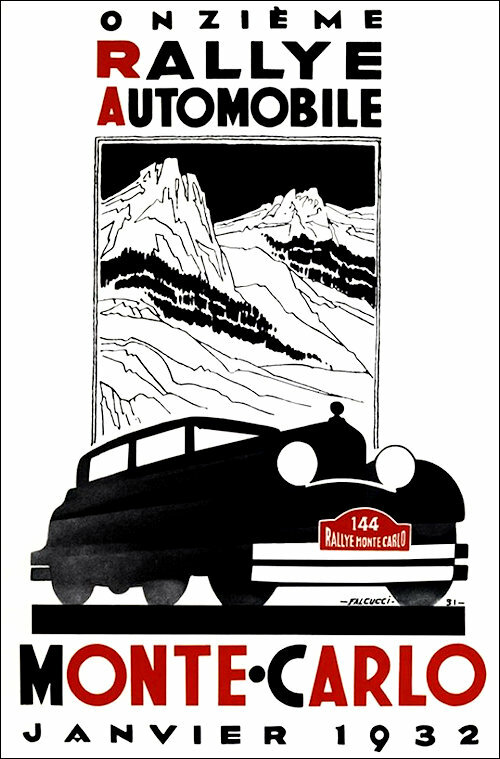 A short trip of ten minutes and we were off again towards the German frontier, where we learnt that there were only three large cars ahead of us, Chiron and Escher on Bugattis and Johansson on a Nash. Here de Clifford took over the wheel of the Lagonda and made the really consoling average of 54 m.p.h. on the straight German roads over the 100 miles to Hamburg, where we wandered frantically for three quarters of an hour searching for the control. Of course, it was again the middle of night. 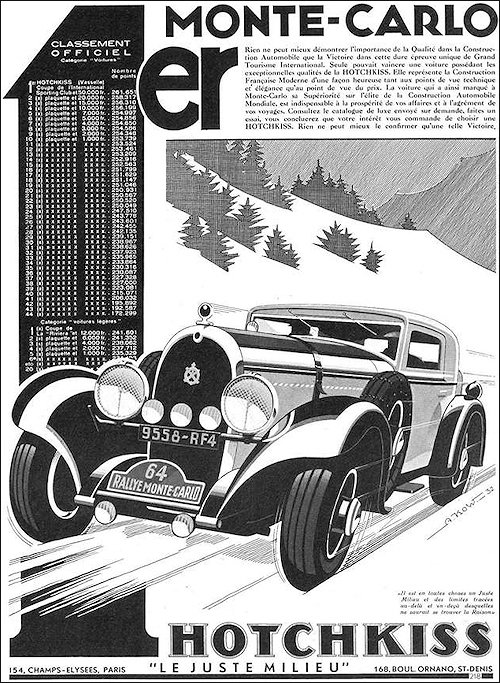 At one o'clock on the morning of Monday, the 18th, we left the Hamburg control for the long stretch of 375 miles to Brussels. Clear dry roads were met with, and we had a pleasant run to the Dutch frontier, stopping at Iburg for breakfast and a much needed wash and shave—not unwanted after two days of travelling. Customs formalities were quickly over and we left for Ittervort and the Belgian frontier. So rapidly did we pass from one country to another that we had some difficulty in remembering in what country we were at any particular time. On this day (Monday) between midnight and midnight we were consecutively in Denmark, Germany, Holland, and Belgium. We made good time to Brussels where we actually arrived seven hours before the control opened. We were able to give some slight attention to our good steed, Lagonda, draining the crankcase and refilling with fresh oil. This done we adjourned to a hotel, had hot baths, a short sleep and a real square slap-up dinner, which was our first solid meal since leaving Umea 2½ days before. We left Brussels for Paris at 11.30 p.m. piloted out of the town by a Belgian sportsman on a Graham Paige. We had a good run to Paris, and the joint Belgian and French customs official beat our record for frontiers, the Belgian occupying 3 minutes while the French surpassed this by passing us through in 1 minute. 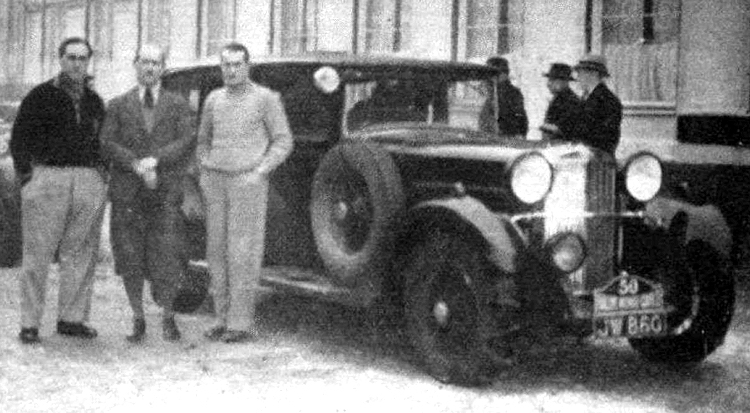 We arrived in Paris at five a.m. and de Clifford spent the next five hours working on the car, as the starting motor bracket had broken and, it was necessary for this to be in working order on our arrival at Monte Carlo in order to avoid loss of marks. 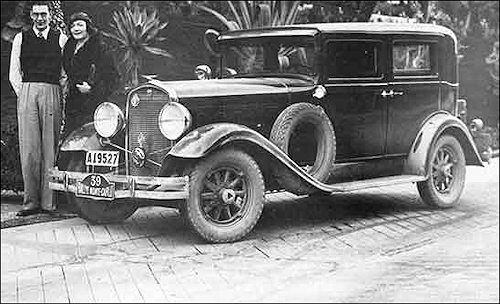 The remaining two members of the crew snatched a few hours sleep, and eventually we left the Paris control at 11.30 a.m.
Lord de Clifford's Lagonda just after crossing the Belgian frontier. Joyfully we took the Route National to the south while de Clifford coiled himself up in the back of the car in order to make up for his loss of sleep in Paris. A brilliant blue sky greeted us, and smiling French countryside unrolled itself before us at a most satisfactory speed. Lyons was reached. at 7 o'clock, and here the great news met us. The Athens contingent had got through, and great was the rejoicing at the first successful conquering of the impossible. May Heaven protect us from ever having to travel towards Lyons in the opposite direction to that taken by the competitors immediately after the opening of the Lyons control at 9.9 p.m. In the scrum to get away the leaders were Chiron and Escher (Bugattis), Ivanowsky (Ford Special), Blairie (Lorraine), Symons (Sunbeam) and de Clifford (Lagonda). 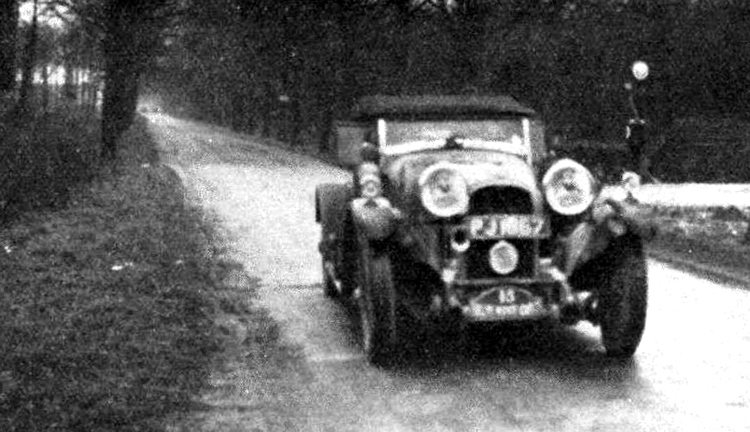 The Sunbeam with Norman Garrad at the wheel, and de Clifford driving the Lagonda shot side by side absolutely flat out through the streets of Lyons, until de Clifford took the lead. 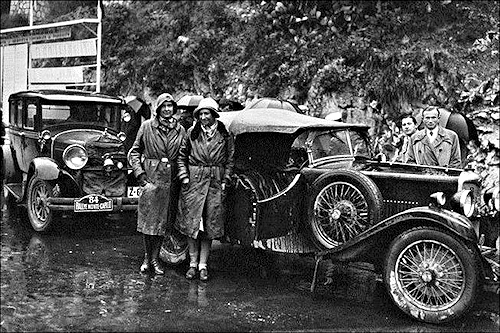 In spite of the rain which made the roads dangerously slippery, 56 miles were covered by the Lagonda in the first hour out of Lyons. Hereabouts a really serious accident occurred. The exact facts are still difficult to obtain but it is believed that Dr. Sprenger Van Eijk had some trouble with his tail lamp. He stopped to attend to it, and while two of his companions were stooping over it, another competitor travelling at high speed, and with the windscreen fogged by the rain crashed into the two unfortunate men, causing injuries from which one of them died shortly afterwards, and compound fractures of both legs to the other. Thus, one of the common dangers of the road, has taken its tall, and sufficient sympathy cannot be given both to Dr. Van Eijk, who has endeared himself to British competitors by his sportsmanlike behaviour, and, also to the driver of the car which struck the back of Van, Eijk's car, as it is certain, that under the prevailing conditions no possible blame can be attached to that driver. At last the rain cleared off, and as the usual fog which appears to live around Briguolles was missing this year, a very pleasant final night's run was enjoyed. 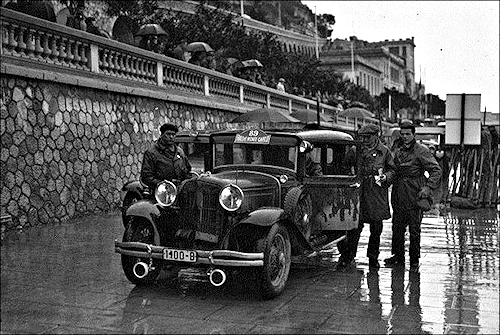 Monte Carlo was not at its beat to greet the travel-stained cars and competitors. It was pouring with rain as the control opened at 10 a.m. on Wednesday the 20th, and the checking of seals, etc., was proceeded with. Immediately each car had been, checked, it was required to undergo a special test with a view to finding the winner. This special test consisted of travelling 100 metres as slowly as possible on top gear and, accelerating as fast as possible over the following 100 metres, also on top gear. Here a very serious flaw in the regulations appeared. 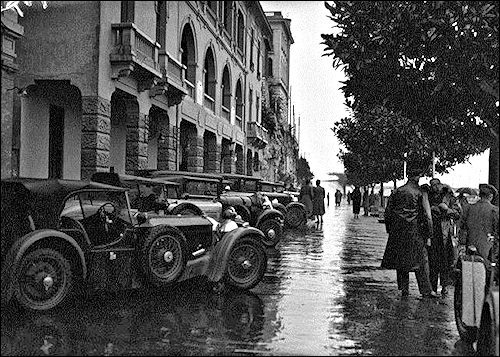 Rumours were heard of staffs of mechanics stationed in various places near Monte Carlo ready to fit new rear axles containing extra low gear ratios, while tiny wheels to reduce the gear ratios still further certainly appeared. For example, one French car arrived at the finish fitted with wheels that would have been eminently suitable for, say, a Morris Minor, but were most decidedly not fitted, to the car when it left Umea. One has no hesitation in saying that back axles should have been sealed to prevent the changing of the ratios after the journey was completed, and wheels of standard size should have been obligatory. Judging by the sound of the engine revolutions at the end of the accelerating portion of the special test at the finish, some of the small cars must have top gear ratios in the neighbourhood of 8 or 9 to 1, and it is safe to say that these cars could not have averaged the required speeds over the long-distance part of the route on these ratios. Let us hope that such a grave error will not be allowed to spoil the Monte Carlo Rally another year. 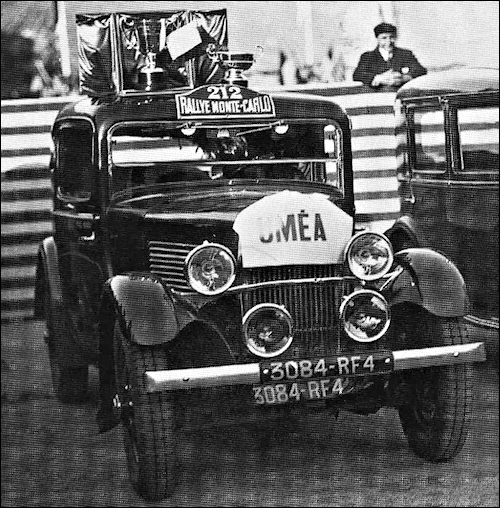 So ends the Rally 1932. The fascination of this type of event must be experienced to be believed, and one can only hope that next year British entries will be increased. Some more of our racing drivers should try these events. 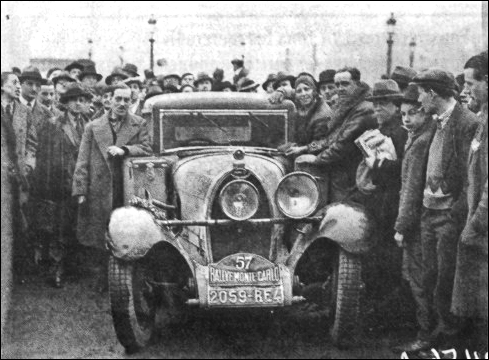 Scott, so well known for his exploits at the wheel of his Delage, had, never taken part in such an event before, and was wildly enthusiastic throughout, though he said that from the point of view of hard work, he would rather drive in, four 500 miles races than one Monte Carlo Rally. It's a great show. Come and try it next year. The best story of this year's Rally is worth repeating. Somewhere in Sweden a man came up to a British competitor and said in broken English, "Do you come from Glasgow? I speak French." 6th, M. Chauviere, 2470 c.c. Chenard Walcker (Umea). SMALL CAR CLASS. (1100 c.c.). 6th, Mrs. Vaughan, 1,018.c.c. Triumph (Umea).